George Baca, Aisha Khan and Stephan Palmié (eds. ), 2009, Empirical Futures. Anthropologists and Historians Engage the Work of Sidney W. Mintz, UNC Press, Chapel Hill, NC 240 pp. Since the 1950s, anthropologist Sidney W. Mintz has been at the forefront of efforts to integrate the disciplines of anthropology and history. Author of Sweetness and Power: The Place of Sugar in Modern History and other groundbreaking works, he was one of the first scholars to anticipate and critique "globalization studies." However, a strong tradition of epistemologically sophisticated and theoretically informed empiricism of the sort advanced by Mintz has yet to become a cornerstone of contemporary anthropological scholarship. This collection of essays by leading anthropologists and historians serves as an intervention that rests on Mintz's rigorously historicist ethnographic work, which has long predicted the methodological crisis in anthropology today. Contributors to this volume build on Mintzean interdisciplinarity to provide productive ways to theorize the everyday life of local groups and communities, nation-states, and regions and the interconnections among them. 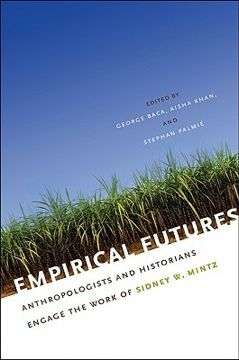 Consisting of theoretical and case studies of Latin America, North America, the Caribbean, and Papua New Guinea, Empirical Futures demonstrates how Mintzean perspectives advance our understanding of the relationship among empirical approaches, the uses of ethnographic and historical data and theory-building, and the study of these from both local and global vantage points.